About two years ago I posted a recipe for basooc dolma. (Reminder: Armenian spellings can vary greatly!) It’s great for vegetarians and vegans, and is a delicious preparation for Lent, which, by the way, begins on Monday, February 8th this year, according to the Armenian Church calendar. Just the other day, my friend Sonia told be about a FB page called ‘Inside the Armenian Kitchen’. Although the name of this page is very similar to my website’s, we are not related. I was happy to see, however, that some of The Armenian Kitchen recipes and photos are featured, along with recognition to my official website. Sonia, with her bounty of information, has provided the following regarding another traditional Armenian food to start New Year. “I recently saw a recipe posted on FB page 'Inside the Armenian Kitchen' for BASUTS DOLMA. This is a ritual, ancient food, dedicated to the gods, begging for fertility of the coming year. Basuts is prepared with all the grains that are to be sown and for the same reason, put dried fruits in it. Each region has its own variation, due to its climatic condition. For example, in Vayots Tsor, where the people use rose hip in their foods, the basuts dolma is cooked in the juice of rose hip. In the villages of Lake Sevan, where the weather is too cold, they cook it with a lot of seeds of hemp. In Lori, add some amount of potato puree' is added. In Marash, it is served with tahini sauce. 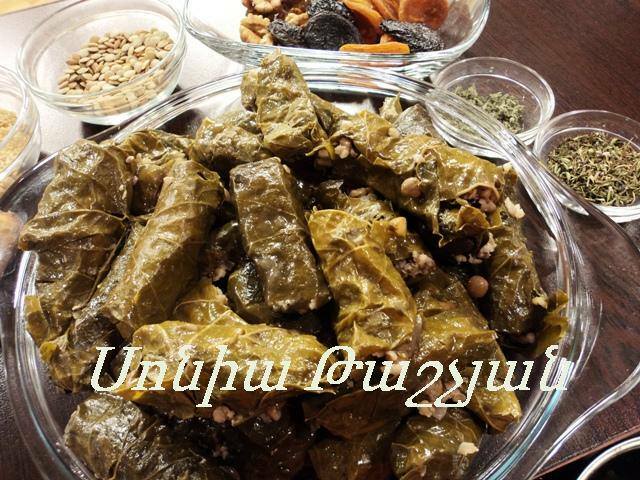 In the villages, the dolmas are wrapped in the leaves of pickled cabbage, but in the cities, for example in Van, they use grape leaves. Sonia offers her own version of classical basuts dolma. - cook until the water is absorbed. - let it completely cool, or else it will break into pieces.